Every year on October 31, we prepare for Halloween and we have fun at the theme, horror parties. Costumes of vampire, werewolf, witchcraft, and imitation of heroes and favorite artists are in great demand long before this date, a sign that no one is left behind by a dreadful scare on the darkest and most crowded night of monsters of the year. The house of horror is ready for the most courageous adventurers, and for the little ones who go from house to house to scare the neighbors and get the much dreamed sweets, candies have frightening and funny shapes. According to the tradition of Halloween, anyone going to a party chooses a costume. For fear of being recognized by the spirits of the dead, people disguised and wore masks after sunset. The tradition said that the people who were born on Halloween night were meant to see and communicate with the spirits and that if you attended a dinner in Halloween night, you were supposed to talk at dinner, so the spirits nearby were encouraged to participate at dinner as well. Scary, is not it? Because there is so little time before this celebration arrives, and surely many of you have not yet finished the necessary preparations, the VirtualCards team has made a list of tips and suggestions to help you find the most horrible, funny or weird costumes and decorations. We all know that the Halloween night is when the spirits are free to walk among people. Do you want to scare your friends with the most frightening costume or simply integrate yourself in the setting of the night? Supermarkets have prepared a series of costumes, masks or makeup to help you get your plan done. In addition, with VirtualCards, you're always up to date with the offers your favorite merchants prepare during this period so you can enjoy even more of this holiday. Whether you want to be a clown, witch or werewolf, here you find everything you need to make your costume look as authentic as possible. 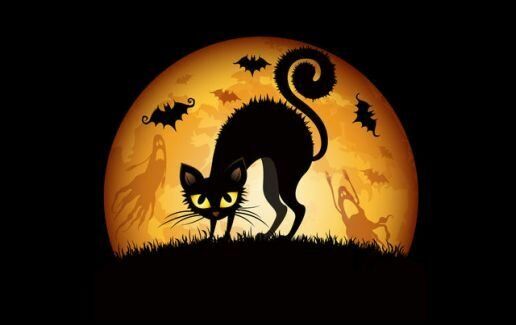 The most sought-after costumes are vampire, bad witch, but also the least frightening, such as black cat or clown. What would Halloween be without the long-awaited sweets by children? Make your supplies in time! You find candy, jelly, lollipops in specific shapes and colors. Spiders, zucchini, eyes, witch hats await you in hypermarkets to fill your shopping cart and the heart of happiness of children eager to gather as many. Make a shopping list before leaving the house and write down all the sweets you want to take to make sure you do not forget anything. VirtualCards also gives you a helping hand this time, so you can make the shopping list directly in the app and get rid of the long and endless sheets! In addition, sweets complete the atmosphere and Halloween décor if you spread them through the house! How do you decorate your home this Halloween? It's a question you need to think about in the first place, so that you do not get caught up in the night of the spirits. Whether you decided to make your decorations yourself or buy ready-made ones this year, there are plenty of ideas that can help you decide! Sculptures or pumpkins, phosphorescent stickers, sculpted pumpkins, scary figurines, frightening door coronas are just a few ideas you find in stores and bookstores, but not only. For example, uncountable trickled pumpkins have become a Halloween habit and are meant to drive away evil spirits. We've come up with just a few ideas, but there are a lot of other ways you can scare your friends. You just have to let your imagination work! So, what costume will you wear this year?